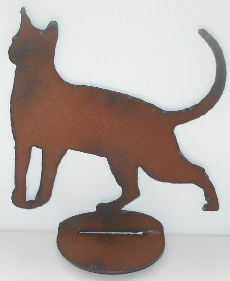 Here is a cat figure made of iron that you can use indoors or out. The figure is 4" wide x 3 3/8" high. 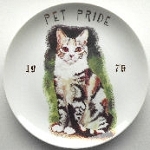 The cat figure is attached to a small base that juts out 1 5/8". There is a hole in the base so you can insert a small stake to anchor the figure to the ground. Indoors it would be used as a bookend, shelf sitter or as a decoration at the base of a plant. The limit is your imagination.